A great treat! My 2 year old even loved them. Thanks for sharing! This recipe tasted OK. Oddly enough, following the ingredients to a T there wasn't enough blueberry flavor, even with blueberrys and blueberry yogurt. These were very good. I used whole wheat flour and added some flax seed. 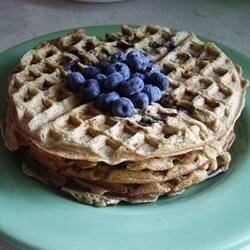 My boys seemed to like these better than other blueberry waffles we've tried. My blueberry loving husband rated these waffles a 4 & 1/2. It was a pain to make and it had way to much flour. The dough was thick and the blueberries stuck to the waffle iron. I was very excited to make it and it disappointed me. This recipe was very good!! I subbed 1/2 cup wheat flour and only had plain whole milk yogurt and they turned out great! !